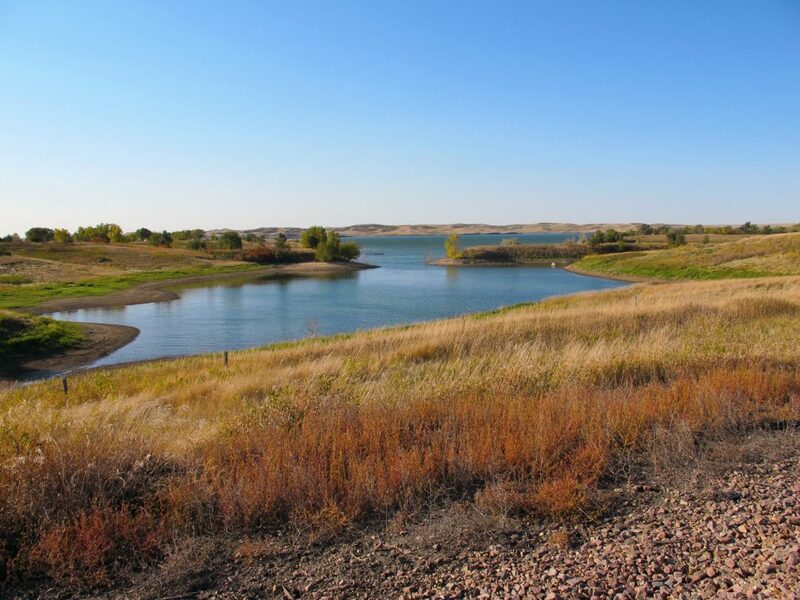 Small bay on Lake Oahe on the Missouri River. By Argyleist, via Flickr, CC-BY-2.0. In April 2016, the Standing Rock Sioux tribe began organizing a campaign to challenge the construction of the Dakota Access pipeline through territories just north of their reservation and across the Missouri River and Lake Oahe, the tribe’s primary water source. The tribe, and its supporters, contest that the pipeline’s route threatens their fundamental water supply and that insufficient environmental review and consultation with tribes threatens tribal sovereignty. Since that time, a movement has grown at Standing Rock, inspiring the largest gathering of American Indian tribes in over a century. In attempting to understand this historical contestation over water resources and tribal sovereignty, the question of treaty rights has been on the lips of Standing Rock water protectors, as well as scholars, community leaders, politicians, and commentators. 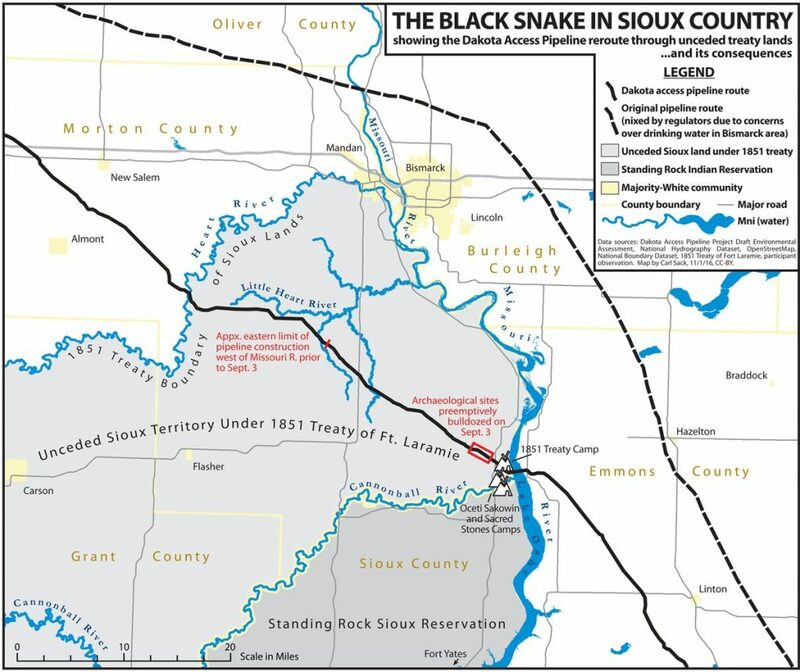 The Black Snake in Sioux Country, showing the Dakota Access Pipeline reroute through unceded treaty lands and its consequences. Map by Carl Sack, November 1, 2016, CC-BY. Treaties signed by American Indian tribes and the colonial, and later, federal governments between the 1600s and 1871 gave rise to physical and legal landscapes that remain vitally important to American Indian sovereignty, Constitutional law, and questions of resource protection in the United States. Treaty history is complex, and treaty documents themselves are charged with unequal power dynamics, problems of interpretation, and unforeseen consequences. Many treaties were signed under specious circumstances, or with inconsistent understandings by participants as to what the treaty ultimately signified. Indeed, the histories of treaty making—and breaking—are foundational to tribal/federal relationships, American law, and the violent westward expansion of the United States in the 1800s. Members of the Sioux Nation—a group comprising several distinct tribes—signed over 30 treaties with the U.S. government between 1805 and 1868. Two of these—the 1851 Treaty of Fort Laramie and the 1868 Treaty with the Sioux and Arapaho—are essential to understanding the contemporary relationship between Sioux tribes and the U.S. government. Though Congress passed a statute that ceased treaty-making with American Indian tribes in 1871, treaties remain important legal documents that recognize tribal nations as sovereign entities. Further, treaties establish American Indian tribes’ unique political status as groups set apart by their sovereignty, rather than ethnicity. Treaties, and the circumstances surrounding their negotiation, also provide some of our clearest insights into the fraught and dynamic encounter between American Indians and settlers in the burgeoning United States. Legal scholar Robert Williams, Jr. argues that treaties must be understood as an engagement between colonial law and American Indian visions of law, marked by cycles of confrontation and accommodation over time (Williams 1997, 7). The Fort Laramie treaties of 1851 and 1868 document this confrontation and accommodation, mediated through two very different legal traditions, and provide important insights into negotiations over the legal, social, and political interactions between tribes and the government. By late August 1851, tens of thousands of Cheyenne, Sioux, Arapaho, Crow, Assiniboine, Hidatsa, Mandan, Gros Ventre, and Arikara peoples gathered approximately thirty miles south of Fort Laramie—which was unable to accommodate the large number of attendees—at the mouth of Horse Creek in present day Western Nebraska. They, along with nearly 300 U.S. federal representatives and soldiers, convened a treaty council to address increasing migration of settlers and gold prospectors into Western territories and ongoing territorial conflicts between tribes. The ensuing negotiations, and the treaty document that emerged, dealt with conflicts between American Indian nations and with the U.S., addressed increased westward expansion by settlers and prospectors, and reflected both Indigenous and American legal traditions. According to anthropologist Loretta Fowler, the treaty council was conducted in accordance with Native custom—treaty participants and government officials distributed food and gifts, superintendent of Indian Affairs D.D. Mitchell conducted individual meetings with each tribe, and proceedings were founded upon ceremony and an expectation of mutual trust (Fowler 2015, 365). The U.S. government agreed to respect tribal lands, and bind its military to protect tribal interests in these lands, took responsibility for compensating any depredations to tribes by Americans, and agreed to a limited term of annuity payments. Horse Creek Treaty, 1851, via National Archives, Washington, D.C. The treaties made claims on the physical landscape, and the landscape formed the boundaries of the treaty. Horse Creek provided water and sustenance for the unprecedented gathering of treaty parties, their families, and their horses; area rivers—the Missouri, Heart, Platte, Yellowstone, Powder, White Earth, Big Dry Creek, and Musselshell (referred to as Muscle-shell in the treaty)—established vital reference points and shaped the contours of the treaty maps. While the U.S. government had an interest in clearly demarcating tracts of land and jurisdictional boundaries, tribes reserved off-reservation hunting and subsistence rights, preserving broader territorial claims for gathering foodstuffs. In exchange, the treaty guaranteed Americans safe passage across tribal lands, and allowed the U.S. to build forts and roads in tribal territories. In the years following the 1851 treaty, settler migration onto tribal lands increased significantly, decimating buffalo and other game. Meanwhile, U.S. troops violated provisions ensuring the peace and protection of Indian nations. Tribal members retaliated by disrupting railroad construction, fighting back against military incursion, and in some cases, kidnapping settlers in their territory. Neither party effectively adhered to the treaty’s restitution mechanisms. In many cases, U.S. agents withheld annuities provided under treaty obligations, or sold them to the tribes at inflated cost. Tensions mounted across the plains as the discovery of gold in Colorado in 1858 further increased migration across the 1851 treaty territories. A U.S. military expedition pushed into the Dakota Territories in 1863 and 1864, and the military’s decimation of a Cheyenne village at Sand Creek in 1864 sparked even deeper distrust of the federal government (U.S. War Department 1883, at 131–151, 948–958). The treaty council of 1868 reconvened at Fort Laramie under circumstances of heightened animosity and suspicion. Formally known as the Treaty with the Sioux—Brulé, Oglala, Miniconjou, Yanktonai, Hunkpapa, Blackfeet, Cuthead, Two Kettle, Sans Arcs, and Santee—and Arapaho, 1868, this document was much more detailed than the 1851 treaty. The 1868 treaty functioned as a peace treaty, extended the obligations of the U.S. to tribal parties, promised educational resources and civil services, and renegotiated territorial boundaries. In exchange for territorial cessions, the U.S. promised that the land retained by the Sioux and Arapaho should be “set apart for the absolute and undisturbed use and occupation of the Indians herein named” (Treaty with the Sioux, 1868, Art. 2). 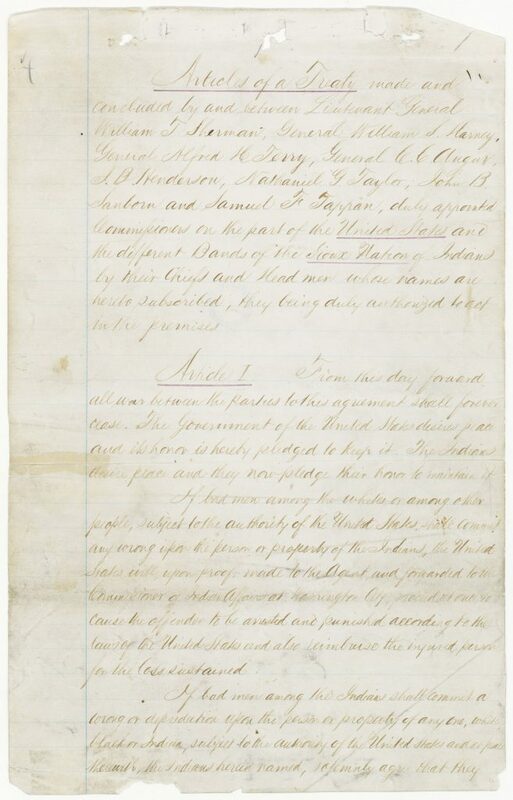 Fort Laramie Treaty, page one, 1868, via National Archives, Washington, D.C. The Missouri, North Platte, and Smoky Hill Rivers again featured as significant resources and boundaries. References to the construction of the railroad through Sioux territories highlight its proximity to the North Platte River, gesturing to the railroad’s disruption for migrating animals and communities that relied on the water source. The 1868 treaty also reflected the U.S.’s expanding policy efforts to disrupt Native communities’ traditional customs and subsistence practices in favor of assimilation to American cultural structures. 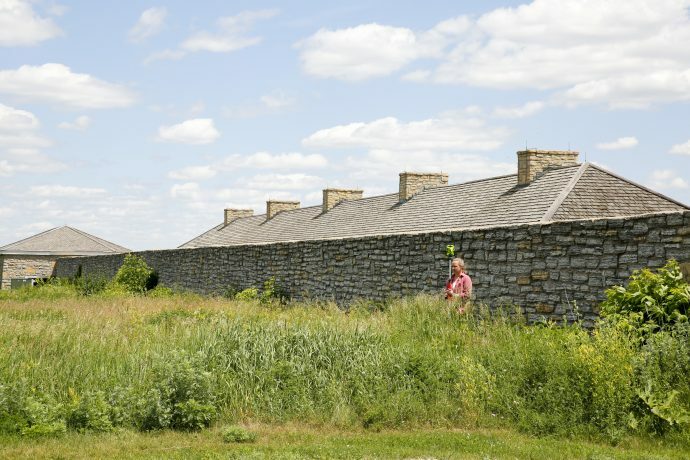 The treaty text instituted preferences for private property parcels, encouraged laws for land inheritance, and provided incentives for any head of household that shifted from hunting and fishing to agricultural subsistence. While tribes continued to retain off-reservation hunting and subsistence rights, the treaty offered higher annuity payments to tribal members who transitioned to a farming economy. Restitution provisions that reflected tribal legal traditions were replaced by a mandate that any American Indians who committed harm to any person or property (white, Indian, or otherwise) should be delivered to the U.S. government for punishment. The circumstances surrounding the 1868 treaty negotiations, and the tenor of the treaty document differ markedly from the 1851 treaty. Reading the two documents in tandem illuminates the changing face of U.S./tribal relations in the mid-nineteenth century. Whereas the 1851 treaty was negotiated with attention to Indigenous customs and reflected dispute resolution mechanisms favored by Indigenous treaty parties (Fowler 2015, 365), the 1868 treaty demonstrates the U.S.’s more heavy-handed position with regard to tribal nations, and establishes the U.S.’s desire to assimilate the Sioux into American property arrangements and social customs. Those political shifts culminated three years later in an 1871 Congressional Act barring future treaty making. In 1877, after a failed attempt to create a new treaty to annex additional Sioux territory, Congress violated the 1868 Fort Laramie treaty when they voted to unilaterally seize the Black Hills. As the 1851 and 1868 Fort Laramie councils suggest, treaties must be understood as complex and historically contingent documents. As Williams argues, treaties are rich resources for understanding the political prerogatives, fears, and interests of tribes and U.S. government representatives at key moments in American history. The treaties continue to impact legal and physical landscapes in the present by animating critical questions about how tribal sovereignty and U.S. federalism can continue to coexist, and to what ends. These questions are often litigated through courts, and in court documents, treaty texts take on an additional layer of complexity. Treaties’ original text or agreed-upon terms may be differently interpreted by judges, or may stand in as justification for legal holdings beyond the scope of the treaty. In this way, treaties can take on new life in legal jurisprudence. Federal Indian law scholars Wilkinson and Volkman summarize three primary rules of American Indian treaty interpretation that have developed through the court decisions: 1) “ambiguous expressions must be resolved in favor of the Indian parties concerned;” 2) “Indian treaties must be interpreted as the Indians themselves would have understood them;” and 3) “Indian treaties must be liberally construed in favor of the Indians” (Wilkinson and Volkman 1975, 617). Despite the promises of these interpretive rules, Federal Indian Law—or the body of U.S. law and jurisprudence that relates to tribes—is rife with contradictions, oversights, and abuses. 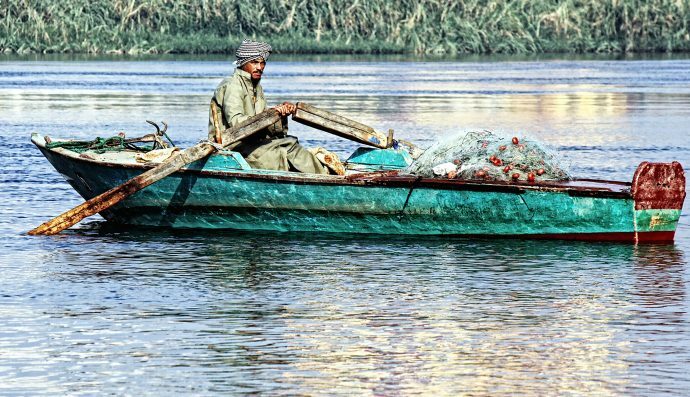 While courts have routinely relied upon treaty language and provisions in developing legal opinions, the judiciary has struggled to develop a consistent canon of treaty interpretation. As legal scholar Frank Pommersheim argues, treaty doctrine “is extremely pliable—at times so pliable that it is better described not as doctrine, but as chimera totally at the service of national objectives” (Pommersheim 2009, 69). Utilizing treaty texts as primary sources requires deeper investigation into the context and consequence of the treaty process and negotiations. Many courts have failed to do this work, and have further relied on interpretive canons that impinge tribal sovereignty and autonomy in grave and destructive ways. As we look at the relevance of treaties in the present moment, it is important to understand that treaty rights form a basis for the relationship between tribal nations and the United States. Treaty negotiations, while challenging and problematic in their own right, reveal some of the pressing concerns of these multiple sovereigns attempting to reconcile contradictory interests and disparate legal traditions. They are also a legal record of the U.S. government’s territorial expansion, and shed light on how the dispossession of tribal lands over time fuels contemporary disenfranchisement and discontent. 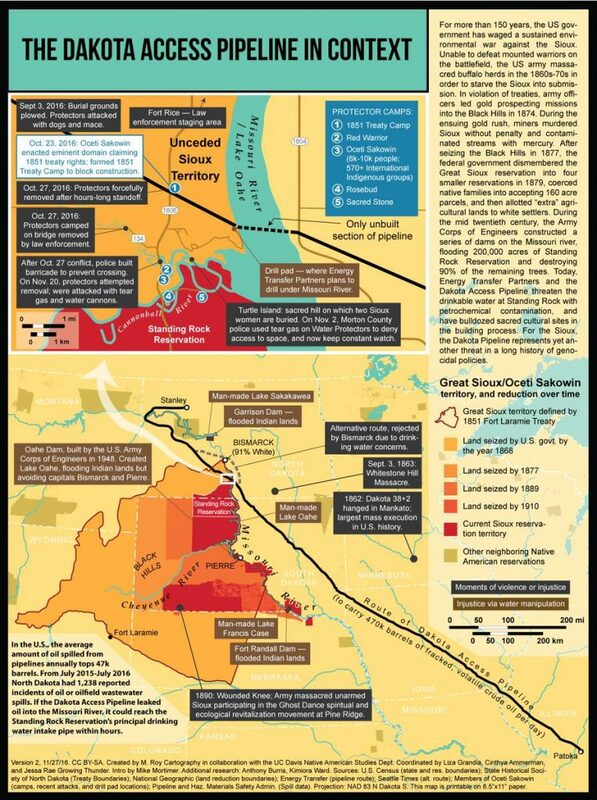 The Dakota Access Pipeline in context. Created by M. Roy Cartography. CC-BY-SA. In the essential and ongoing struggle over water at Standing Rock, and beyond, treaties remain tremendously relevant. But, treaty rights are often only one component of broader legal claims, which can be addressed through different mechanisms at the tribal, state, and federal level. While the rights and obligations established by the 1851 and 1868 treaties were central to the decision in U.S. v. Sioux Nation of Indians, and were highlighted in the Standing Rock tribe’s complaint in the Dakota Access pipeline case, treaties were no more than a passing reference in the District of Columbia Circuit Court’s order dismissing the tribe’s request for an injunction against pipeline completion (Standing Rock Sioux v. USACE, 1). As such, the Standing Rock challenge to the Dakota Access Pipeline builds upon the treaty relationship, but utilizes a host of other legal tools, such as the National Historic Preservation Act and various environmental protection statutes. And yet, even these diverse mechanisms emerged from a legal and political system indelibly shaped by the treaties signed with Indigenous nations. Treaties—texts, histories, and consequences—illuminate the contestations and accommodations upon which claims to sovereignty, territory, and resources are built. While the Missouri River was essential to the Fort Laramie treaty maps, only time will reveal the treaties’ impact on the river. Bernholz, Charles D. & Brian L. Pytlik Zillig. 2010. “Comparing nearly identical treaty texts: a note on the Treaty of Fort Laramie with Sioux, etc., 1851 and Levenshtein’s edit distance metric.” Literary and Linguistic Computing 26(1): 5–16. Deloria, Vine Jr. 1996. “Reserving to Themselves: Treaties and the Powers of Indian Tribes.” Arizona Law Review 38: 963–980. Deloria, Vine Jr. & David E. Wilkins. 1999. Tribes, Treaties, and Constitutional Tribulations. Austin, TX: Univ. of Texas Press. Fowler, Loretta. 2015. “Arapaho and Cheyenne Perspectives: From the 1851 Treaty to the Sand Creek Massacre.” The American Indian Quarterly 39(4): 364–90. Harjo, Suzan, ed. 2014. Nation to Nation: Treaties Between the United States and American Indian Nations. Washington, D.C.: National Museum of the American Indian & Smithsonian Books. Pommersheim, Frank. 2009. 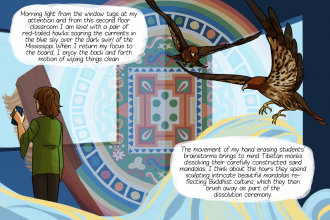 Broken Landscape: Indians, Indian Tribes, and the Constitution. New York: Oxford University Press. Standing Rock Sioux Tribe v. U.S. Army Corps of Engineers, No. 16.1534 (JEB) (D.C. Cir. Sept. 9, 2016). United States War Department, John Sheldon Moody et al. 1883. The war of the rebellion: a compilation of the official records of the Union and Confederate armies. Series 1, Volume 41, Part 1. Washington, D.C.: Government Printing Office. Available digitally from Cornell University Library. U.S. Department of the Interior, Hilary C. Tompkins. 2016. Tribal Treaty and Environmental Statutory Implications of the Dakota Access Pipeline. Memorandum M-37038, Office of the Solicitor. Washington, D.C., Dec. 4, 2016. https://turtletalk.files.wordpress.com/2017/02/tribal-treaty-and-environmental-statutory-implications-of-the-dakota-access-pipeline.pdf. Wilkins, David E. & K. Tsianina Lomawaima. 2001. Uneven Ground: American Indian Sovereignty and Federal Law. Norman, OK: University of Oklahoma Press. Wilkinson, Charles F. & John M. Volkman. 1975. “Judicial Review of Indian Treaty Abrogation: As Long as Water Flows, or Grass Grows upon the Earth—How Long a Time is That.” California Law Review 63(3): 601–661. Williams, Robert. A., Jr. 1997. Linking Arms Together: American Treaty Visions of Law and Peace 1600–1800. New York: Oxford University Press. Wroth, Lawrence Counselman. 1928. “The Indian Treaty as Literature.” Yale Review 17(4): 749–66. Act of Feb. 28, 1877, 19 Stat. 254 (1877). Montana v. U.S., 450 U.S 544 (1981). Treaty of Fort Laramie with Sioux, etc., 1851. Charles J. Kappler, Indian Affairs: Laws and Treaties vol. 2. (Govt. Printing Off. 1904), 594–596. Available at: http://digital.library.okstate.edu/kappler/Vol2/treaties/sio0594.htm. Treaty with the Sioux—Brulé, Oglalala, Miniconjou, Yanktonai, Hunkpapa, Blackfeet, Cuthead, Two Kettle, Sans Arcs, and Santee—and Arapaho, 1868. Charles J. Kappler, Indian Affairs: Laws and Treaties vol. 2. (Govt. Printing Off. 1904), 998–1007. Available at: http://digital.library.okstate.edu/kappler/Vol2/treaties/sio0998.htm. U.S. v. Sioux Nation of Indians, 448 U.S. 371 (1980). U.S. v. Winans, 198 U.S. 371 (1905). U.S. v. Winters, 207 U.S 506 (1908). This is the preferred term used by tribal leaders and their supporters who are working to protect water quality and supplies at Standing Rock and elsewhere. Download PDF of Treaties & Territory: Resource Struggles and the Legal Foundations of the U.S./American Indian Relationship by Laura Matson. Laura Matson is a PhD candidate in the Department of Geography, Environment and Society at the University of Minnesota and an alumna of the University of Minnesota Law School. Her research focuses on legal geography, federal Indian law, environmental law, and tribal jurisdiction. She is a recipient of the University of Minnesota's Interdisciplinary Doctoral Fellowship, and is supported by the Water Resources Center and the Institute for Advanced Study. When I got fully engaged with Mississippi River work, in the mid-90s, there was a lot of talk about public-private partnerships. That has ebbed and flowed and morphed over the years, but the idea of partnership has remained. Pretty much anyone in any sector—public, nonprofit, or corporate—understands that work beyond a small one-time project rarely happens through just one entity. 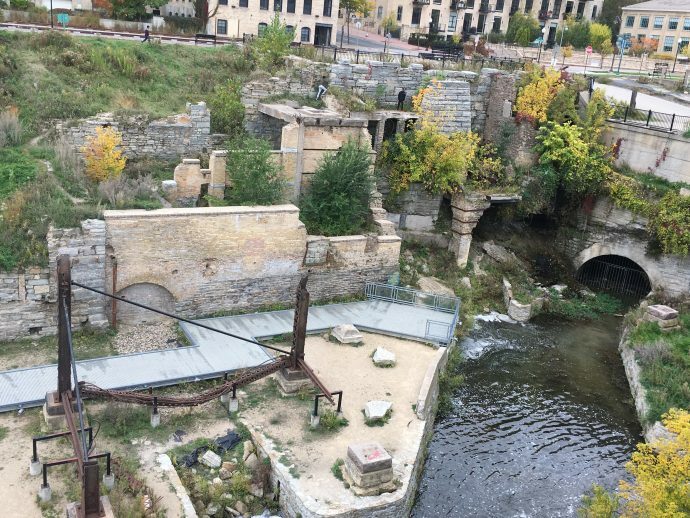 The Mississippi National River and Recreation Area touts itself a “partnership park,” but what does that mean, especially in the context of the National Park Service (NPS) overall? When most people think of national parks, they imagine Yellowstone, the Grand Canyon, the Everglades, the Statue of Liberty, or some other iconic park or place. Healing Place Collaborative (HPC) is an association of 40 professionals from many fields who share an interest in the Mississippi River as a place of healing and a place in need of healing. Indigenous-led and artist-led, the group includes language activists, educators, environmentalists, scientists, therapists, community organizers, public officials, and scholars. 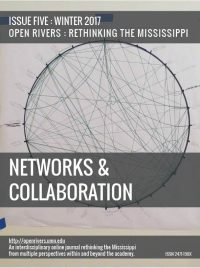 How can dozens or even hundreds of organizations working on the Mississippi River be harnessed into a powerful body that has demonstrable influence in our nation’s capital, in capitals of states along the river, and in other places where the health of the river is decided? Over thousands of years the Mississippi River deposited fresh water, nutrients, and sediment through a vast American territory to form one of the world’s grandest deltas. Today, Louisiana’s coastal wetlands—a critical ecosystem in this delta and a place we call “America’s Wetland”—is dying. Citizens who appreciate the importance and preservation of our country’s natural resources know that governmental agencies need assistance to do their jobs. That’s why in the conservation arena so many not-for-profit or nongovernmental organizations (NGOs) are acting to augment and monitor the work of the government agencies. In November 2016, I visited Water/Ways, hosted from October 1 to November 13 at the Goodhue County Historical Society in Red Wing, Minnesota. This traveling exhibition and community engagement initiative— which then moved on to Sandstone, Minnesota—is part of the Smithsonian’s Museum on Main Street and is available at a series of venues nationwide through April 2017. ...A movement has grown at Standing Rock, inspiring the largest gathering of American Indian tribes in over a century. In attempting to understand this historical contestation over water resources and tribal sovereignty, the question of treaty rights has been on the lips of Standing Rock water protectors, as well as scholars, community leaders, politicians, and commentators. Many Minneapolis residents don't know about Bridal Veil Falls, yet there was a time when it was one of the area's most memorable and sought after tourist attractions. The history of Bridal Veil Falls is one of both human admiration and change. Higher education has increasingly embraced what is variously called public, civic, or community engagement over the past two decades, and more and more students arrive on campus having participated in community service or service-learning as part of their K-12 education.